It was sunny. It was hot. It was Friday afternoon. Normally a description like this would warrant a trip to the beach. A lazy trip to the beach--to nap, to read, to catch some sun, to maybe dip the toes in Lake Michigan. 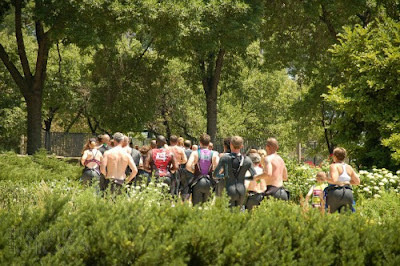 Not for a group of triathletes. Forget skipping out of work (or being fortunate enough to have half-day Fridays Memorial Day to Labor Day) to bum a boat ride, crash on the beach or get a head start for home. 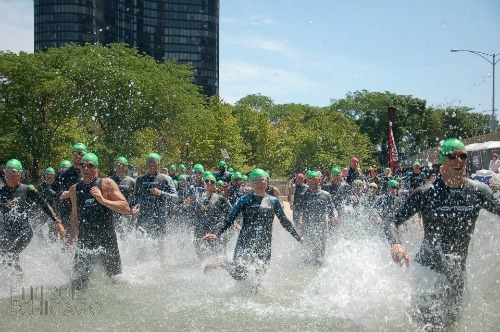 They were armed and ready to swim and run--all in the name of the kicking off the 30th anniversary of the Life Time Chicago Triathlon, which has seen a few name changes in its 30 years (Bud Light, Mrs. T's, Accenture...). 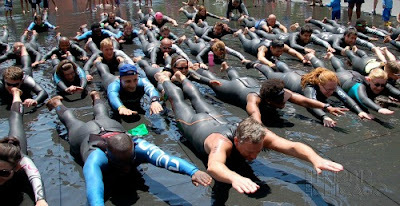 And they did it in their wetsuits--I'm sweating just thinking about it. 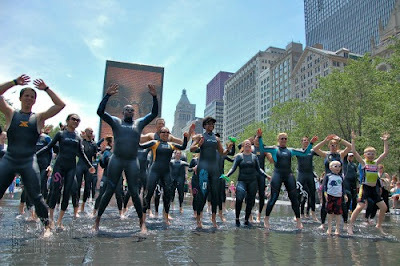 Nothing like a little warmup in the Millennium Park water feature. There's a core and spine strengthener. I don't miss supermans from swim practice's dryland warmups. Never mind the parade-like procession from Millennium Park to Ohio Street Beach--triathletes took splash and dash seriously and were running to get to the water. Still running--at least there's shade on the bridge that crosses the Chicago River. Doesn't it look a little like a race start? Then it was back to Park Grill Plaza in Millennium Park for happy hour. Now that's how to cap off the work week. 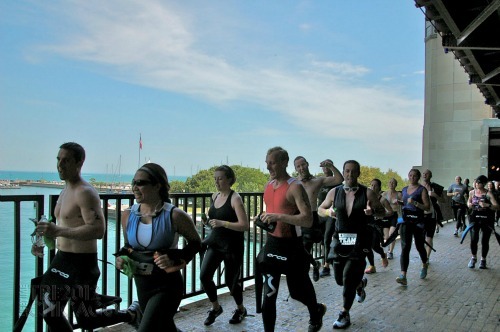 To view more images from the Chicago Triathlon's wetsuit dash, check out this Facebook link. Photos courtesy of the Chicago Triathlon.